Los Angeles Congresswoman Hilda Solis is to join the Obama Cabinet as Secretary of Labor. By appointing the strongly pro-union Solis, president-elect Barack Obama has sent a clear signal to his far left support base that he has not abandoned his roots. 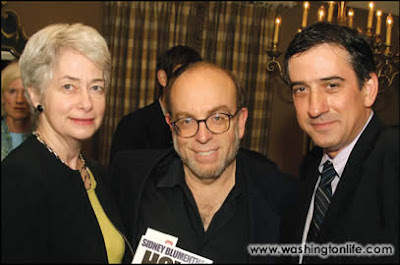 Stern is one of the US labor movement's new breed of leftist leaders-trained by the Chicago based and Democratic Socialists of America (DSA)controlled Midwest Academy. Bonior and Sweeney are both DSA members and both serve with Hilda Solis on the board of American Rights At Work. Most other ARW board members have DSA connections, including Julian Bond who was active in the DSA's predecessor, the Democratic Socialist Organising Committee and labor academic Harley Shaiken-also touted for the Labor Secretary job. The fact that four board members of what is essentially a DSA front were the main contendors for the Labor position, is revealing. It doesn't stop there however. "It's extraordinary," SEIU president Andy Stern said in an interview with us a few moments ago. "On every issue that's important to us, she has stood up for an America where everyone's hard work is valued and rewarded." Some labor officials had initially thought that an elder statesman type with stature would be best in the gig. But Stern said he thinks the choice of Solis by Obama, who has a keen appreciation of the power of biography, wanted someone with a bio steeped in labor, someone who has the kind of built in dedication and passion that could make her a kind of labor star in a cabinet that is stocked with a fair amount of star power already. "As opposed to some candidate [for whom] this would have been just a job, for Hilda Solis it's the fulfillment of a life-long dream," Stern said, adding that that Solis was one of the names that labor officials had privately communicated as acceptable to them in talks with the transition. "Her father was a teamster. She is the American dream." Hilda Solis is also a leader of the Congressional Progressive Caucus, the 70 odd strong group of left wing Democrats with strong ties to DSA. DSA is clearly a friend of Hilda Solis, but is Hilda Solis a friend of DSA? 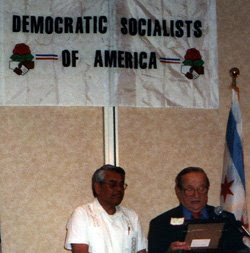 In November 2005 Solis addressed the DSA National Convention in Los Angeles-"The New Capital of Progressive Politics?" While the gathering was a working convention—one that differed from past meetings in that all convention business happened on the plenary floor for maximum delegate participation,two evening public sessions focused on the big picture, too. for a New Economy looked at the level of struggles nationwide. Hilda Solis (D) who in turn provided in-depth perspectives of the political scene. DSA, the SI's main US affiliate was represented by DSA National Director Frank Llewellyn plus Duane Campbell and Dolores Delgado Campbell of DSA's Anti Racism network and the Latino networks. California State Senator Gill Cedillo, was also in attendance. This was not the first time that Solis had sent a representative to a socialist gathering. The audience clapped, cheered and sometimes shouted out during the spirited tribute to Jerry Acosta, regional director of the Utility Workers Union, and Gilbert Cedillo, long-time leader of Service Employees International Union Local 660. Alarcon recounted many of Acosta's and Cedillo's achievements, calling them "real live working class heroes in the forefront of struggle" who "take bold initiatives on labor issues" and spearhead mass action in the fight for equality of all people. If there is any time that we value that kind of leadership, "it is now when we face the greatest electoral challenge of our time," Alarcon said pointing to the necessity "to vote out the Republican ultra-right in the Congress and in the California State legislature." Rep. Esteban Torres, a UAW labor leader in Congress, wearing his union jacket and standing tall, told the crowd, "This event would have made old Sam Kushner proud," referring to the late World labor reporter. Los Angeles City Councilman Richard Alarcon, on behalf of the council which adopted a resolution honoring Acosta and Cedillo, said, "Gil Cedillo and Jerry Acosta have changed the whole dynamic of what it means to be for the working class and what it means to fight for workers rights. Because of them and other labor leaders, we have seen a resurgence of strength of the least empowered in our country..."
State Assemblyman Antonio Villaraigoza sent a message and 17 elected officials and more than 50 labor leaders put their names in the program book honoring Cedillo and Acosta. Victoria Castro, a member of the L.A. City Board of Education, sent certificates recognizing the two labor leaders. This piece is important because it shows the influence of the CPUSA in Southern Californis Politics. The CPUSA has substantial influence in the Los Angeles labor movement and by directing union money and human resources in the right direction is able to determine who gets elected and where. Richard Alarcon is now a Los Angeles City Councillor. Both Richard and his communist big sister Evelina, are close friends and supporters of Los Angeles Mayor Antonio Villaraigoza-who incidentally now serves on Barack Obama's economic transition team along side DSA member and Hilda Solis supporter David Bonior. Both Richard Alarcon and Antonio Villaraigoza were elected with strong union support. Maxine Waters is now a stalwart of the Congressional Progressive Caucus. Hilda Solis also enjoyed strong union (and CPUSA backing) when she ran for US Congress in 2000. She was joined by her friend and DSA honorary chair, Dolores Huerta, former colleague of legendary Farmworkers Union leader Cesar Chavez. 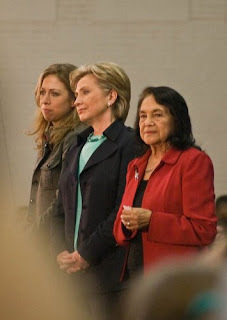 Dolores Huerta had the honour of formally nominating Hillary Clinton for the Democratic primary. By 2008 Hilda Solis was campaigning under a new slogan "Yes we can"-the anglicised version of Cesar Chavez's old battle cry "Si se puede". "As the Latino community continues to get to know Senator Obama, it is clear that he is the right candidate for our issues and is the best candidate to deliver the change that America desperately needs," said Congresswoman Hilda L. Solis. "Senator Obama not only understands the struggles and diversity of our community but because of his personal history and background he will stand with us and be a fighter for our issues. I look forward to continuing to work to elect Senator Obama as the next President of the United States." and Nydia Velázquez. Another member was Service Employees International Union Executive Vice President and DSA honorary chair Eliseo Medina. Medina also has close ties to Chicago DSA-the same people who endorsed Barack Obama during his successful bid for Illinois State Senate in 1996. DSA has supported Barack Obama through his entire political career. Is appointing Hilda Solis to such a key position simply Obama's way of returning a favour, or is it indicative of a shared agenda?